CHARLOTTE AMALIE — Hurricanes Irma and Maria busted out the Virgin Islands and Puerto Rico, but that doesn’t mean your cruise will get blown away, too. Most of the 50 cruise ports throughout the region suffered little or no damage and remain open. The four major ports that were affected plan to reopen by late November. The major ports hit the hardest — St. John, St. Thomas and St. Croix, St. Maarten and San Juan, Puerto Rico — are expected to open by the end of November, said the Florida-Caribbean Cruise Association on a press call Monday. Our region is a vast area of more than a million square miles. It includes countries in Central America, such as Mexico, Belize and Honduras, that are top cruise destinations and were untouched by Irma or Maria. In the Eastern Caribbean, some places were largely spared, too, including Jamaica, the Bahamas and Cuba. The Southern Caribbean, home to Curacao, Aruba, Barbados and others is still open for business. But that’s not what some cruisers think, according to the cruise lines. Some travelers are staying away from the region altogether, based on a perception of region-wide devastation left behind by a hurricane one-two punch. That means bad news for cruise lines that do a sizable chunk of their business in the region. A single cruise season generates $2.4 billion for the Caribbean, 55,000 jobs and $842 million in wages — and that’s in only 21 of all Caribbean ports, according to a 2015 study , said Michele Paige, president of the Florida-Caribbean Cruise Association. A single cruise call generates about half a million dollars in economic impact. To combat perceptions of a closed Caribbean, the leaders of Carnival Corp., and Royal Caribbean Cruises are coming together with the association to bring travelers back to the region. As part of a multi-million-dollar campaign, the Florida-Caribbean Cruise Association launched caribbeanisopen.com on Monday to highlight rebuilding and reopening efforts at affected destinations throughout the region. The effort is aimed partly at helping economies dependent on tourism to kick-start recovery. “We are working diligently to return the ships to the itineraries because we know it’s the lifeblood of those destinations,” Paige said. The cruise lines have another goal as well: Recouping some of the lost revenue caused by the hurricane season. Carnival CEO Arnold Donald said the Doral-based cruise company lost 10 percent to 12 percent cents in revenue per share as a result of canceled cruises, redirected cruises and the uncertainty created after the storms. The good news is that cruise itineraries should return relatively back to normal by the end of the year — and that means the ancillary shore excursion operations, too. Royal Caribbean International’s Adventure of the Seas is scheduled to return to St. Thomas on Nov. 10 — making it the first cruise ship to return after Hurricane Irma. 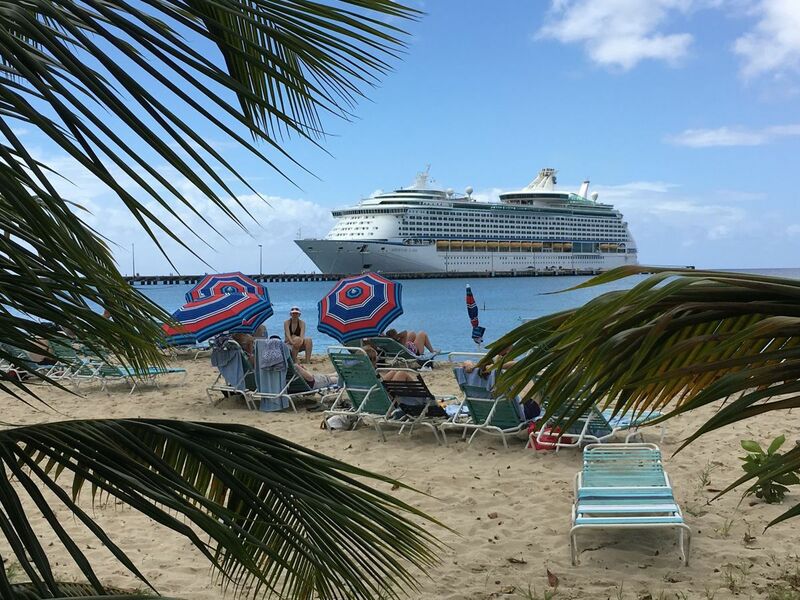 The downtown area in Charlotte Amalie is in “good shape,” said Adam Goldstein, president and chief operating officer for Royal Caribbean Cruises, adding that the cruise company is “very bullish” about the progress on the island. Royal Caribbean is working particularly to restore the beach area at Magen’s Bay, a popular attraction. Miami-based Norwegian Cruise Line has altered the 4,266-passenger Norwegian Escape’s Eastern Caribbean itineraries that include St. Thomas for the remainder of the year to Western Caribbean voyages with stops in Mexico, Belize and Honduras, for instance, instead. St. Croix suffered significant damage from Hurricane Maria when it passed nearby on Sept. 19. But the island, whose port was used for relief operations in lieu of the heavily damaged ports in nearby St. Thomas and St. Maarten, is expected to start welcoming 90 scheduled cruise ship calls beginning Nov. 11, said Gov. Kenneth Mapp on Friday. Grand Turk was in the unlucky path of both hurricanes Irma and Maria — but the cruise pier was spared. Thanks to that, Carnival Cruise Line is offering seven sailings to the island beginning Nov. 4. St. Barts, like nearby St. Maarten, was pummeled by Hurricane Irma on Sept. 6. Officials expect the island to be open for the arrival of the Crystal Serenity on Oct. 30. Hurricane Irma passed directly over the tiny island of Barbuda, effectively flattening the island and destroying more than 90 percent of homes. The port in Barbuda will remain closed indefinitely, but nearby Antigua is open to cruisers. St. Maarten, a top Caribbean cruise port drawing more than 1.6 million travelers a year, was plowed by Hurricane Irma. The island’s port and airport were both damaged. But recovery is underway: Princess Juliana International Airport reopened early this month, and the port is expected to start welcoming tourists back by Nov. 11, Paige said. Goldstein of Royal Caribbean said there is “a lot of clean up to do in St. Maarten, for certain,” but that he wouldn’t be surprised if the country was running at a high level of quality by January or even before Christmas. Carnival’s Donald said that he expects to see top shore excursions, like a zip line adventure that Carnival offers on St. Martin, the French side of the island, to be back in operation by Dec. 1 — a key component to cruise lines returning to the island. Norwegian Escape itineraries with stops in St. Maarten have been switched out for Western Caribbean itineraries through the end of the year. Hurricane Maria hit Guadeloupe on Sept. 18, but the island is expected to be open to cruise passengers again Sunday with the arrival of Holland America Line’s Koningsdam. Dominica took a brutal hit by Hurricane Maria on Sept. 18 and 19, rendering it unable to welcome cruise ships likely until the start of next year, officials have said. The small island in the Southern Caribbean is not a major cruise port, however. Puerto Rico is nearly back to normal operations for cruise passengers. Royal Caribbean International’s Adventure of the Seas started calling on San Juan again on Oct. 7, and Carnival Cruise Line’s Carnival Fascination returned to San Juan on Sunday. San Juan Luis Muñoz Marín Airport is also running close to pre-storm levels. Still, rebuilding efforts are in the early stages in Puerto Rico, which was slammed by Hurricane Maria as a Category 4 storm on Sept. 20. Goldstein said Royal Caribbean is focusing its excursions in the city core of Old San Juan, which has partially reopened and where some businesses have power. The line is staying away from offering excursions to the damaged El Yunque National Forest, he said. Norwegian Cruise Line is scheduled to return to San Juan on Nov. 12 for eight sailings of the Norwegian Dawn. Tortola took a hard hit from Hurricane Irma, but its cruise port suffered only slight damage, said tourism officials. The BVI Ports Authority has scheduled the re-opening of at least 50 percent of the port’s retail and food and beverage stores by Nov. 1 — with cruise ships likely to follow after. Trees stand barren and debris lays on the roadside, caused by Hurricane Maria in Road Town, on Tortola in the British Virgin Islands, early Wednesday, Sept. 20, 2017. Caribbean cruises remain a popular itinerary for most cruise lines. Take Carnival Corp.: about 60,000 guests are currently sailing on 20 ships in the region, Donald said. ▪ In the Eastern Caribbean: Anguilla, The Bahamas, Cuba, Dominican Republic, Jamaica, Key West and St. Kitts. ▪ In the Southern Caribbean: Antigua, Aruba, Barbados, Bonaire, Curacao, Grenada, St. Lucia and Martinique. ▪ In the Western Caribbean: Belize, the Cayman Islands, Costa Rica, Honduras, Mexico and Panama. To learn more about Royal Caribbean’s relief efforts in the Caribbean, visit their hurricane relief page.